Kevin Knapp is on 1st and 2nd on Hot Creations Top 10 Chart on Beatport! with his own “Heft” and “Vibrate” feat Audiojack! Keep it up!! 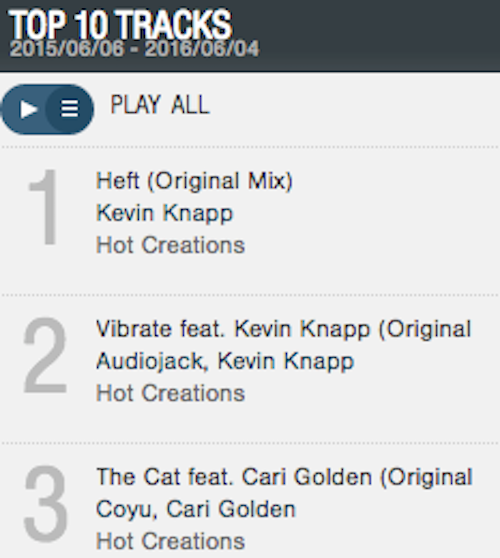 Kevin Knapp is on 1st and 2nd on Hot Creations Top 10 Chart on Beatport! with his own "Heft" and "Vibrate" feat Audiojack! Keep it up!! Kevin Knapp is on 1st and 2nd on Hot Creations Top 10 Chart on Beatport! with his own “Heft” and “Vibrate” feat Audiojack!